[David Burroughs] wrote in to share this dial telephone museum exhibit he built and we’re glad he did because we love interactive museum hacks. He mentions that it’s not really tied to the theme of the Roads and Rails Museum in which it’s installed. But when we think of railroad history we also think of telegraph. And that’s just a hop, skip, and a jump from telephones. The display allows museum goers to play with the rotary dial on the phone. The box next two it contains a 10-position relay increment switch. So each pulse from the dial increments the switch. There’s a satisfying click, a moving arm, and different colored LEDs which highlight the inner workings. An Arduino board monitors the phone, displaying the dialed number on a seven segment display then incrementing the relay. We figure the interesting part is to see that telephony used to use mechanical switching like this. But the video below includes a story about the kid who asked how you carried this phone around. This brings to mind the phrase “hang up the phone”, which doesn’t have the same literal meaning it used to. [Niklas Roy] calls it his Perpetual Energy Wasting Machine, but we know it for what it truly is: a building-sized most useless machine. You’ll remember that a most useless machine is a bobble that uses clever design to turn itself off once you have turned it on. This does the same thing with the elevator of the WRO Art Center in Wroclaw, Poland. The one difference is that it continually turns itself on and off. He rigged up a pulley system that travels through the stairwell of the building. Whenever the elevator door on the top floor opens it causes the call button on the bottom floor to be pressed. The same thing happens when the elevator reaches the ground floor. But he didn’t stop there. Since the device is just wasting electricity whenever the elevator moves without passengers in it, he added a meter to track the loss. It’s the guts of a printing calculator strapped to the inside of the car. Every time the doors open it adds to the total. You can see the installation in the video clip after the jump. For those who are unfamiliar, “Freeze Frame” is the name of a common display in science museums. It is a small dark room with a single wall covered in phosphorescent material. Opposite of this wall is a flash on a timer. You enter the room, strike a pose and wait for the flash, then view your shadow preserved on the wall behind you. [Bill] was saddened to see the display at his local science museum had been decommissioned long ago. All that was left was a dark room with a phosphorescent coated wall. Some industrious employees had rigged up some LED pens for people to “draw with light”, but in [Bill’s] opinion this wasn’t as impressive. He promptly volunteered to rebuild the display himself and we commend him, both on the fantastic job he did as well as his service to his local community. Great job [Bill], keep up the good work. [Bill Porter] continues finding ways to help out at the local museum. This time he’s plying his skills to fix a twenty-year-old exhibit that has been broken for some time. It’s a laser spirograph which had some parts way past their life expectancy. He started by removing all of the electronics from the cabinet for further study in his lair. He examined the signal generator which when scoped seemed to be putting out some very nice sine waves as it should. From there he moved on to the galvos which tested way off of spec and turned out to be the offending elements. A bit of searching around the interwebs and [Bill] figured out an upgrade plan for the older parts. But since he was at it, why not add some features at the same time? He rolled in a port so that just a bit of additional circuitry added later will allow shapes and logos to be drawn on the screen. One of his inspirations for this functionality came from another DIY laser projector project. Take a look at the results of the repair process in the clip after the break. 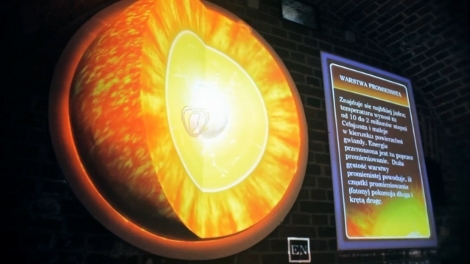 A few common components come together to make this interactive museum exhibit that teaches about the sun (translated). It uses three main physical components to pull this off. The first is a custom projection surface. It’s a hemisphere of the sun with a slice cut out of it. This is presumably coated with the paint you’d use to turn a wall into a projection surface. Software translates a projected image to map correctly on the topographic surface, resulting in what you see above, with a Kinect for user input. Take a look at the video embedded after the break to see how the exhibit works. It instructs patrons to stand on a pair of footprint markers on the floor. This positions them at the proper range from a Kinect depth camera, which translates their outline into cursor commands. By moving a hand around they can explore the different parts of the sun. We’re in love with how easy this type of interaction is becoming. Granted, there’s a fair amount of work that goes into to the coding for the project, but the physical build is quick and relatively inexpensive.